BYPASS PRUNER - 3/4 inch diameter cutting capacity. Resharpenable forged Radial Arc bypass blade. Fully heat-treated, forged Coronium steel alloy construction. Slant-ground, narrow-profile hook. Precision-made, self-aligning pivot bolt. Sap groove. Non-slip, cushioned grips. Designed for general-purpose pruning. Made in USA. Lifetime Warranty. 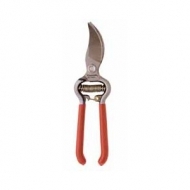 Lightweight Pruner For General Purpose Pruning. Resharpenable High Carbon Steel Blade. Ergonomic, Reinfroced Nylon Handles. POLE PRUNER - 12 IN. COMPOUND - TP3841 12-ft. Compound-Action Tree Pruner with die-cast zinc alloy pruning head. Fully heat-treated, Teflon coated cutlery steel blade with 1 inch diameter cutting capacity. Pass-thru shearing action. Compound-action pulley system triples your cutting power. 15 inch conventional saw blade. Lightweight fiberglass pole telescopes to 12 ft. Weather-resistant polypropylene pull-rope and wood grip. Comfortable, non-slip 24 inch cushioned grip.